Turning a large company into a green, eco-friendly one doesn’t happen overnight, no matter what the business’s press release might say. Instead, emission levels should be measured and other factors taken into account for drawing up a long term plan to become more energy efficient over time. Everyone in the company needs to chip in to achieve this and starting with small changes will make it easier. For new businesses this should be adopted from the start, while established ones can introduce them one at a time. Such adaptions can save money too. A great way to save petrol money and reduce the company’s carbon footprint is to set up a car share scheme for those who drive to work. Encourage employees to use public transportation where possible but when it isn’t, offer incentives to those living close together to share lifts. If you provide company cars, cut back on the number given out, explaining to workers that it’s for the best of the car share scheme. This should result in cheaper fuel costs for employees as well as benefitting the company’s green credentials. Every office ploughs through paper, printer ink and other items of stationery on a regular basis. 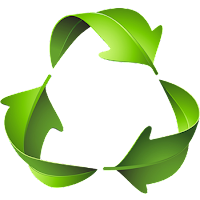 Switching to use recycled paper, pens, pencils and more will have a positive impact considering the amount that is used every day. Some people worry that the paper quality may be inferior but the majority of times work related material is printed out it doesn’t have to be. Reserve regular paper for such occasions. Refill old ink cartridges rather than purchasing new ones, which costs less as well. A recycling scheme in the office doesn’t have to be a complex system. Provide separate paper, plastic and can recycling bins along with one for waste food. All buildings should have council provided waste disposal (including recycling bins) which these can be correctly separated into at the end of the day. Food waste could be added to an employee’s compost bin. Web hosting is important to a lot of businesses and there are a variety of companies providing these services with a green ethos. Green web hosting companies use renewable energy, plant trees and buy carbon offsets to reduce the environmental cost of running servers. These small changes may not seem much, but over time will make a good first step to reducing your business environmental footprint.